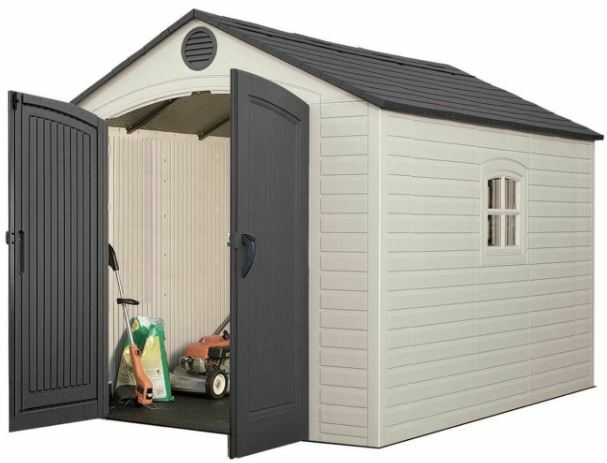 Lifetimes large resin shed welcomes you to modern day living with the elegant appearance of their 8 x 10 plastic shed, showcasing a spotless off-white beige facade, brown matching doors & vents, capped with a grey-slated overspread. 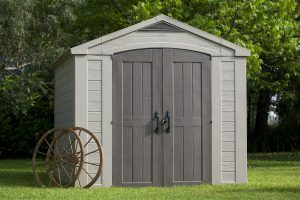 Reviews take quite a shine to the immaculate appearance Lifetime sheds exhibit, a striking addition to enhance any garden’s terrain. Resolute in discovering an alternative to annual upkeep chores & make them a thing of the past turned our considerations to scrutinise a shed constituting a resin makeup. Similar to the polyethylene composition represented here, ours has certainly delivered contentment. Lifetime’s storage facilities make super low maintenance dreams come true, only requiring a light hose down when the grime appears, their relaxed approach to ‘cleanse in a jiffy’ epitomises today’s ease of forward thinking manufactures. 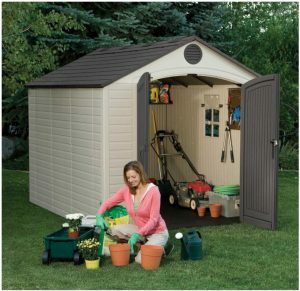 This 8 x 10 ft Plastic Shed is probably one of the most popular garden sheds sold across America. Outstanding reviews uphold its popularity expressed through dynamic feedback. Lifetime’s 8 x 10 ft facility boasts durability and strength. 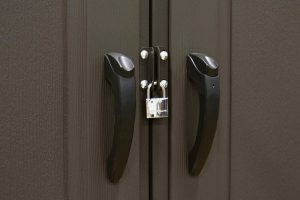 Providing enhanced storage protection against storms humidity & damp the rot-resistant manufacture equips the shed with the essential weatherproof defence outdoor storage demands to maintain prime condition. Lifetimes 8 ft wide sheds increase through the range in 2½ ft extensions, all consisting of identical frontal dimensions & fitments. This model expands 10 feet in depth, the smaller facility spreads 8 x 7½ feet leading up the ranks to the larger expanse stretching 8 x 12½ feet. 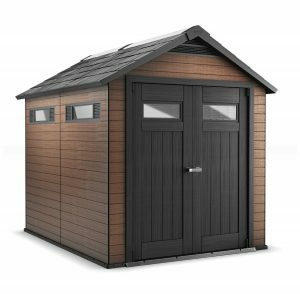 Shed Ranges displays the competition regarding low-maintenance storage shed designs consisting of a weatherproof composition. 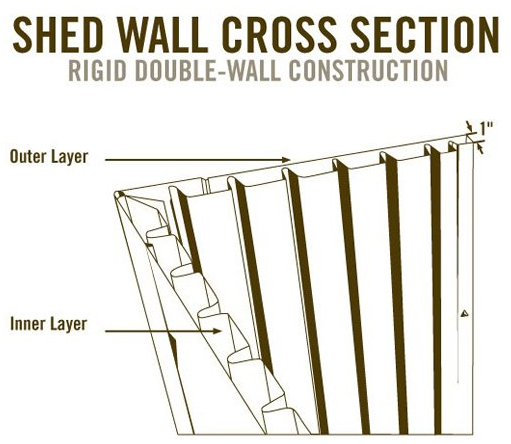 The walls are manufactured in sheet form, molded into a double skin of high-grade resin through a process described as High Density Polyethylene (HDPE), the most versatile of plastics delivering eco-green sustainability due to the entire composition being reusable time-&-time again. The outer layer of the walls combines with the ribbed inner layer providing a sturdy structure preventing the unsightly views dents and chips portray meanwhile steel reinforcements further intensify stability . During assembly the panels interlock within the floor’s periphery, link with adjacent sheets and secure to the framework by driving in screws. The molding technique delivers a resemblance of a horizontal panelled wooden building whilst the lustrous warmth of a desert-sand pigment mixes with the polyethylene producing a modish spotless appearance, blending smartly against the tanned shade of the doors resulting in an easy-to-clean surface, highlighting the attraction of this type of composition. A light pressure hose down usually entails the maintenance however if grime does become ingrained, a soft bush dipped in warm water containing household detergent delivers the simple solution to replenish the shine. We predominantly unreel the garden hose throughout the summer months and wash ours down with the shower connector fitted, job’s finished in a flash. Lifetime sheds are unsusceptible to rust, rot and decay owing to the panels durable make-up meanwhile combining with these weather-resistant positives, UV protection elements amalgamate with the polyethylene preventing the inherent problem of yesterday’s plastic being harmed by sunburn pressures resulting in cracks appearing and the development of that unattractive bleaching effect. Well favoured comments express the resistance Lifetime products have to colour fade. An Apex structure was imperative regarding our decision of roofing, a steep gradient ensures rainfall drains with immediate effect. 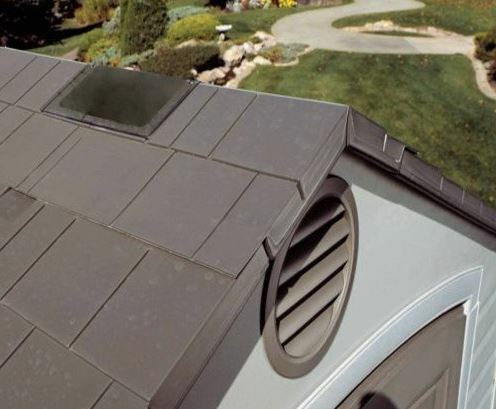 Lifetime’s roof design incorporates a steep descent delivering the effective removal of rainwater. Manufactured from a double skinned body of polyethylene molded into sheet form assures robustness whereas the exterior surface resembles a realistic slate-effect crown, stylishly enhancing the top aspect. Each roof panel is steel reinforced by the framework meanwhile facilitating additional bracing pertains to 3-A frame rust-preserved joists extending across the rafters width buttressing supplementary reinforcements to accommodate significant lumps of snowfall. The roof protrudes adequately beyond the shed walls developing eaves. In conjunction with the steep down-slope, leakage & puddle prevention is attained owing to the walls abutment beneath the roof. Reciprocating from this 8 ft summit, lofty headroom height is returned inside however take note of Lifetime’s solid level base recommendations, these are crucial to aid the correct alignment of the roof panels therefore balancing the roof weight equally across all sides. An easy assembly that delivers a flawless construction all generates from this first step. In sharp contrast to roofing felt, polyethylene resists disintegration through weather-rot, the favourable bonus that puts an end to forthcoming roof replacements. 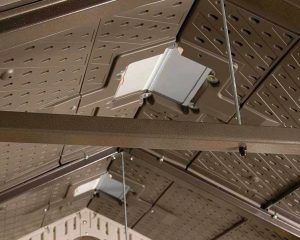 A built-in floor delivers the upper-hand feature with regards to our resin shed. Not only does it live up to the hard wearing description as a consequence of the solid level footings we prepared to attain longevity of demanding use, a clean internal environment transpires owing to the walls interlocking method with the floor, preventing outside debris wafting through crevices down at the base. The lack of a built-in floor on the majority of metal sheds requires you to build a wooden one. Fearful of future wood-rot swayed our decision to consider the plastic variety containing this integrated feature. Lifetime’s built-in floors enclose the unit from the outside environment. 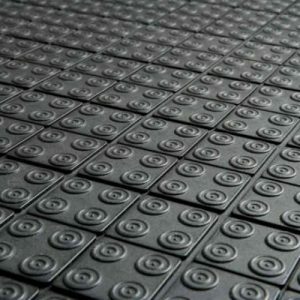 The floor makeup constitutes polyethylene, manufactured into a thickset resin bed designed with an anti-slip grip furthermore it’s resistant to oil stains. A quick wipe-up entails the swift requirement when anything’s spilled meanwhile stood in a damp atmosphere long-term has no bearing on the durable nature of the polyethylene, remaining immune from the process of decay. The resin sheets simply snap into place during assembly, engaging with the walls creates a crevice-free boundary edge. Common to all plastic sheds however they should be firmly secured onto a solid substrate through the anchor indentations positioned within the floor. Not only does this enhance the shed’s overall gale-force steadiness it provides the perfect platform for the floor to tolerate tractor stresses. No worries rolling the lawnmower in, nor driving in on one, Lifetime floors are purposely strengthened to subsist & contend with hefty services however this is dependant on the grounds that the recommended substrate is in situ. 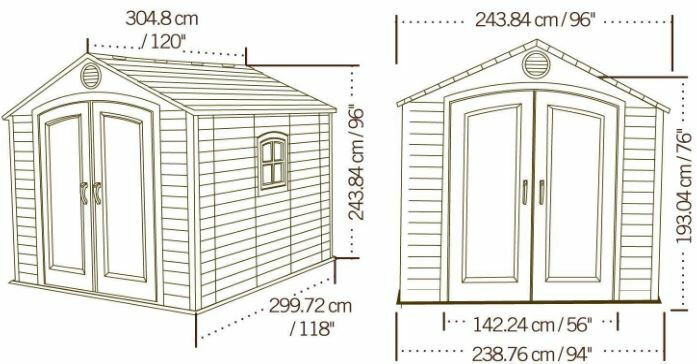 A light and airy environment removes the problem of scurrying around in the dark plus the generous height these utilities comprise prevent banging your noggin, key priorities in our shed decision. Overhead, the apex incorporates 4 small skylights surplus to the benefits of a shatterproof window that can be opened half way for ventilation. These transparent polycarbonate panes enlighten the interior with heaps of daylight providing a free & airy environment. 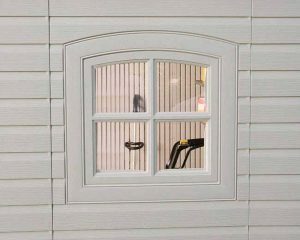 The window can be placed on either side. Two air vents built-in towards the apex peak front and rear help to maintain a preserved atmosphere by generating a fresh stream of air from outside to continually circulate the inner surroundings removing that deep-seated sweaty atmosphere associated with plastic & humidity. Included with this shed are 2 corner shelves, a 90″ straight shelf and two 32″ shelves which are ideal for small items in addition to a pegboard strip with hooks, a useful feature for hanging long handled gardening tools. We and many other shed owners choose to purchase the stand-alone DIY shelving & those huge stacker-boxes to utilise the internal height including the weight they are able to support. It’s surprising what a shed this size is able to accommodate opting to stroll down this route, worth considering. This 8 x 10 footprint enables storing an abundance of stuff, it certainly gets those organisational skills rolling: From heavy duty gardening equipment, patio seating & accessories, barbecue paraphernalia, kid toys, bikes, lawns supplies, sports equipment, etc. The storage list is endless. Purchasing a shed comprising double door access enables organising outdoor storage more efficiently, making the job of carting storage in and out a breeze, the ability to store the patio table and chairs with little effort as well as facilitating swift garden tidy-ups. Lifetime doors are manufactured from twin skinned polyethylene reinforced with textured steel providing a sturdy entrance, rigid hardware fixings and increased security measures, retaining the same durability and decay-resistance properties the walls and roof possess. Galvanised steel hinge pins occupy the entire door length and benefit from escaping breakage issues screwed in hinges are associated with. Their robust design increases stability for their operational swing whilst door positioning is maintained by the roof weight. Large easy-grip handles comprising of a metal latch system open the doors when pressed in. Security-wise, an external padlock clasp adjoins both doors together to enable simultaneous locking. Two deadbolts on the interior of the left door, installed top and bottom maintain closure, beneficial for windy weather meanwhile overall entry delivers an adult walk-through owing to the doors high arch avoiding bending over during entry. A straightforward assembly can be achieved by paying special attention to the initial stages in preparing solid level foundations. We were unaware of these initial stipulations, every sales site fails to mention this #1 priority ruling however there they were headlining the instructions, we thought we’d better comply. A solid material is required: Asphalt, decking, concrete or paving slabs laid uniform & level. Comply and you’ll find the procedure straightforward. Upon assembly the reasoning becomes clear. Levelled footings ease the process of aligning the panels especially 8 ft high. Issues become magnified from a base that fails to be level. We found all the panels lined up with ease for a speedy assembly. Likewise, a level base delivers a straightforward plumb alignment of the architraves making sure the doors swing true in addition to ensuring the roof applies equal force to all sides overcoming leaning pressures. The floor is wholly reliant on the foundation stipulations too, delivering the ideal substrate to endure tractor stresses plus solidity assures rigid anchorage. The Assembly video below demonstrates a terrific insight of how straightforward constructing is, worth a watch prior to assembly. I have noticed recently some companies in the UK are now offering Assembly. Check Prices to find out more. You are required to have solid level foundations in place prior to installation. Due to conservation time restraints, interest has gained traction regarding the quality plastic shed design, becoming an ever increasing option for outdoor storage accommodation enabling to escape future upkeep hassles. Reviews speak volumes for Lifetime’s 8 x 10 ft masterpiece, it’s one of the most popular sheds sold across America. The appearance is divine, a modish style, ultra low maintenance, durable, weather-resistant and delivers stability though its chunky makeup & steel reinforcements. A popular choice for those looking to escape preservation headaches. The sturdy structure delivers an adequate size able to fit many plot sizes & suit most storage needs meanwhile complementing any garden space with neutral tones, easy access and a copious amount of storage accommodation.. This facility’s certainly got plenty of admirers. Thanks for inspecting Lifetime’s large resin shed. If you have any 8 x 10 ft plastic shed queries or favourites, please share below. Always happy to help. Please share Lifetime’s 8 x 10. Thank you! 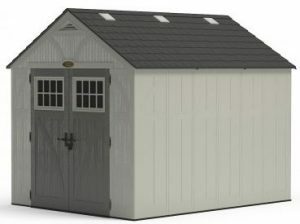 I like this shed, it has large sky lights and vents which to me makes it perfect for a lot of uses, besides just storing stuff inside of it. It will get plenty of natural light, so I could also use this as a workshop. I have been pondering this idea, of getting a shed for a workshop and keeping all my tools in the garage where they are now. Looks like I can get custom shelving for it too! Awesome shed! Thanks for inspecting Lifetime’s large 8 x 10 plastic shed. An airy atmosphere certainly enfolds once you step inside a Lifetime, they are designed high due to the generous inclining roof peak which in return delivers oceans of headroom height inside, this is clear to see when you watch the video. Embedding skylights in the roof to accompany the window illumines plenty of daylight, so there’s no scurrying around in the dark. Many people do opt to turn their shed into an outdoor workshop, great idea to escape home-life’s busy surroundings. Included with the shed are corner and straight shelves which are steel reinforced plus they mount onto vertical steel struts which delivers sturdiness however their width doesn’t allow for a load of bulky storage which leads many to install free standing shelving, those self assembly ones down at the local hardware shop are ideal in accommodating hefty bulky storage, this is what we have done. This 8 x 10 footer is probably one of the largest sellers across the USA, with feedback matching it’s global sales. The only requirement really is anchor them down onto solid level foundations, they’re a good solid shed. 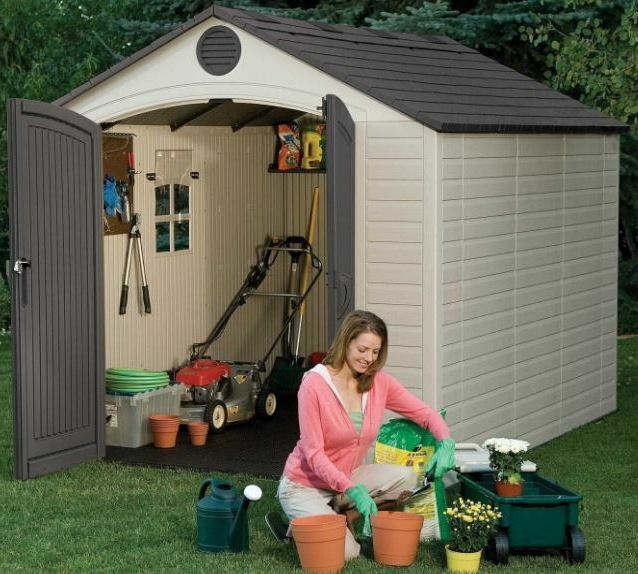 This looks like a very durable shed, I have a riding mower with a 48″ deck will it support parking it in the shed? I love the idea of no wooden floors as I have had issues with them in the past. The price seems fair for the quality it represents. Thanks for dropping by and reading about Lifetime’s 8 x 10 ft Resin Shed. I understand the problems regarding decay issues where wooden floors are concerned, one of the reasons we looked for an alternative, something that would provide sustenance against the floor suffering the long-term pressures of rainfall. These integrated floors are a thickset resin bed with supplementary toughening added to the mix providing a heavy duty surface for the likes of rolling in on a sit-on-mower and wheeling in weighty equipment. Like I mention in the Assembly Section, it’s imperative the foundations are solid and level, either wood or concrete. The floor is purposely designed to cope with demanding pressures If the shed adheres to the foundation ruling. I just wish sales sites would mention the importance of the foundation stipulations. We also find a clean environment is maintained due to the floor connecting to the walls, great around Autumn time preventing leaves congregating inside on the shed floor. I just moved into my new home and had already bookmarked your website, as I knew I would be needing a shed once I moved in. I like this one you have listed, the size is perfect. I was thinking about utilizing one wall inside the shed for a shop. I want to have a table with a pegboard to hang my tools. 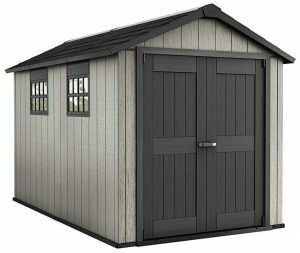 Would this work in this shed, or do I need one made out of a different material? 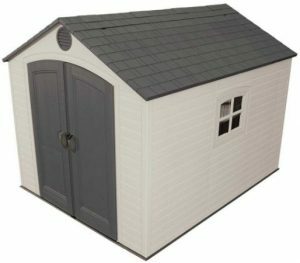 Thanks for calling in and reading about this extremely popular large resin shed by Lifetime. 8ft x 10ft is a popular size as it fits a lot of home-yard plots and fit’s an abundance of storage inside, solutions are quite endless where these dimensions are concerned. Failing that, there’s many other free-standing pieces of equipment to enable hanging tools and the likes. Like we use free standing shelves and stacker boxes to make use of the height in our shed. thanks for this great, in-depth review! To be honest, I didn’t know much about garden sheds, plastic or otherwise, before I visited your website. I really liked the pros of your presented model and our family has been on the fence about buying one for some time now. The Lifetime model looks great, but you also mentioned a few of its competitors – which one would you recommend as your top choice? I must admit I hadn’t really bothered looking until my wooden shed rotted away. We looked for the plastic variety when we replaced our dismantled wooden shed. After reading all the reviews and assembling ours it turned into a right passion of mine, hence this website. I’m just trying to help others looking for a virtually maintenance-free future. We’re delighted with ours. I think looking around, the Lifetime range of sheds are by far the most popular in America whereas Keter seem to be the firm favourite in the UK. If I was going to choose now I think I would opt for the Keter Oakland, this is a new model on the market and I think it looks and sounds divine. We chose the Keter Factor model but this was quite a few years ago now. Don’t let me sway you, everyone is different. They all have their positives and negatives like all sheds, metal, wood or resin. It’s just which you like the sound of best for your circumstances. I have tried to relay all the info in my reviews to provide visitors with a full understanding. you have chosen a unique niche that not many covers. This brings great leverage to your site already. The overall style is presentable and clean, and eases the reading. 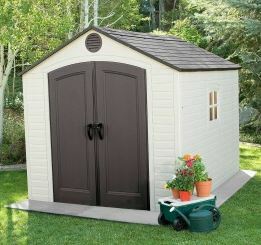 You provided every spec and essential info needed for choosing quality sheds, I couldn’t find any flaws to your page. Very useful to families and people looking into buying sheds. Kudos to great effort ! Not everyone has heard of the plastic or resin variety of sheds but we decided to make a change with our old wooden shed as I was fed up re-staining it every year and with the frequent hassle of re-felting the roof, a change was made. It’s been a great decision on our behalf, a wash down when dirty is all that’s required to bring it back looking new again. I love the peaked roof as rainwater runs straight off, the built-in floor keeps our storage in pristine condition and clean whilst the double doors provide easy access. These shed have turned into a passion of mine, hence this website. It’s great to write about all the various styles and sizes of quality plastic sheds and relay this info to others who are looking for a virtually maintenance-free way of outdoor living.